Here we board on deluxe Stellar for a trip through the magical seascape of Halong Bay where you will have the opportunity to kayak around these impressive islands. Explore remote fishing villages to experience the daily lives of the locals, ancient caves and grottos, kayaking and swimming. 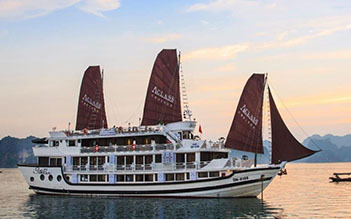 Stellar Cruise is a brand new traditional wooden junk with the charming design in Halong Bay. 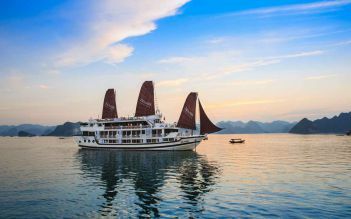 Stellar Cruise has 21 cabins with all well-appointed rooms equipped with air condition, en-suite bathroom, and centralized hot water system which is an ideal choice for you to explore Halong Bay. With spacious, luxury cabins, and the full length of glass windows, the cruise allows the guests to capture the largest view of the bay from cabins. 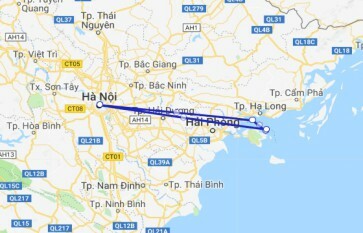 The Stellar Cruise serves typical Vietnamese seasonal gourmet set and buffet menus with the ingredients are carefully selected and prepared by our own executive chef to guarantee the most satisfaction of all our guests. Summit on the sundeck watching the sunset, enjoying cooking demonstration, local wine party, meeting new friends, sharing traveling tip will be one of the memorable moments in your Halong Bay trip.